Tony Oursler's Mind Blow Still, 2018. Courtesy of the artist and Kreëmart. On September 27, New York-based dessert-meets-art concept Kreëmart presents Tony Oursler in the form of a macaron. Conceived by Kreëmart founder and sugar aficionado Raphaël Castoriano, the pastry was developed in close collaboration with Oursler and the macaron masters of the iconic Ladurée. This second rendition of Castoriano’s original project, The Pastry Portrait, follows Kreëmart and Ladurée’s partnership and wild new endeavor to distill identity into a flavor, initiated last year with performance artist Marina Abramović. Oursler’s taste will make a performative debut alongside a new video installation, Mind Blow, in Switzerland at the Hebrew University of Jerusalem’s 100th anniversary gala, hosted on the campus of the prestigious Le Rosey boarding school. We caught up with Castoriano to get a taste of the sweet project. How did this collaboration come about? It all began in the capital of taste, Turin. Tony was having an exhibition at Lingotto and it was there, after dinner, that I presented Marina Abramović’s taste to him. Tony was so fascinated by the concept that he needed one of his own as well. What was the process of developing the taste? It began first with Tony answering the Papillae Questionnaire—a series of personal questions that serves as a base for a tailored flavor profile—in a long, poetic way. During our interview, he brought in products he uses so we can better understand the fragrances he’s attracted to. He even confessed wanting to eat them. Following this, I took a trip to Paris where I met with Ladurée’s team to develop this unique taste. 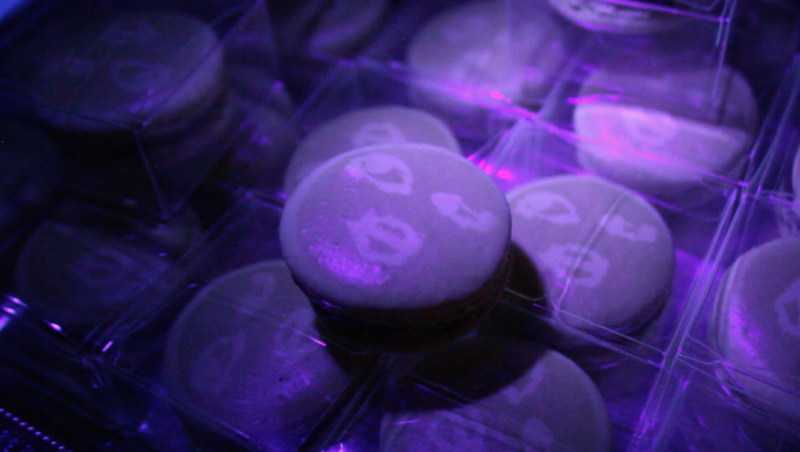 Oursler’s one-of-a-kind macaron illuminates with a blacklight. Courtesy of Kreëmart. What does Tony Oursler taste like? Tony Oursler tastes like landscapes—like upstate New York, stones, moss and ice. Oursler’s taste is a reflection of memories and experiences. This Pastry Portrait allows for an unprecedented, intimate understanding of Oursler—the flavor reflects his personal mindset, his past and present, and provides a glimpse into his brain. You’re presenting this with the Hebrew University of Jerusalem, which focuses so much on research. How does this project tie into the brain? Oursler’s work is already tied into the brain seeing as his aesthetic and interactive technomancy reveal not only the ghosts in the machine, but the psychological impact of humanity’s headlong dive into cyberspace. Therefore it was only natural that I would introduce him to neuroscientist Idan Segev, hoping they would find a common ground. Between the macaron and Oursler’s video installation, what kind of experience do you hope to create for the person trying the taste? An ephemeral one, where we invite the audience to share a unique participatory, sensory experience. We want every individual to watch Tony’s multi-layered, three-dimensional video then judge for themselves Oursler’s taste related to this self-portrait of his life. Future presentations of Mind Blow to be announced.